Last night in Boulder, Colorado, local business men, citizens, and government officials responsible for securing their city as a Host City for the finish of Stage 6 of the 2012 USA Pro Cycling Challenge, gathered to celebrate and say thanks. Tom Danielson, professional cyclist with Team Garmin-Cervelo, attended the event in support and was available to sign autographs and chat. I was fortunate to sit down with Tom for an interview. Tom Danielson is a fast bike racer who likes coffee. He likes coffee so much he started his own company to sell coffee beans. The types of coffee beans offered by TDcoffee (www.TDcoffee.com) are named after Tom's favorite climbs, the same climbs for which he holds the records for fastest ascent: Brasstown, Iron Horse, Madone, Mt Evans, and Mt Washington (his favorite bean and favorite climb). There is one climb missing from this list, and if Tom Danielson had another coffee bean to sell, he would name that bean Flagstaff - after his favorite climb in the state of Colorado. Tom Danielson beams when he speaks of the climb of Flagstaff, and of the town of Boulder, and of the state of Colorado and what each has to offer cyclists of all ages. He is spending countless hours promoting USA Pro Cycling Challenge, the UCI 2.HC ProTour road race in Colorado now in it's second year. 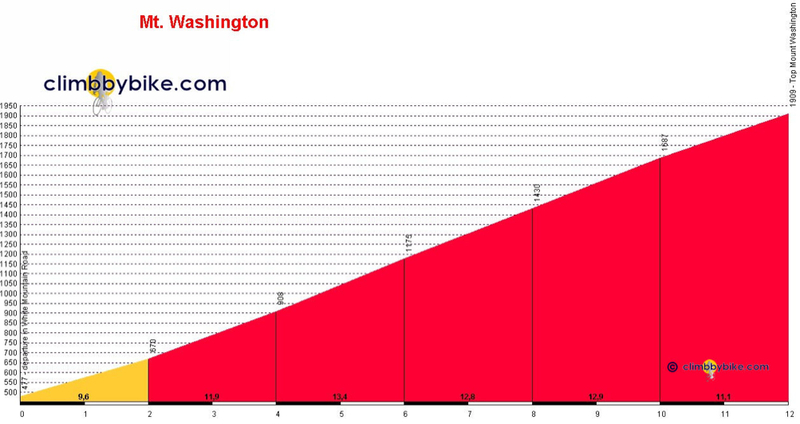 Danielson clearly believes in the race and he is especially enthusiastic about the possibility of Flagstaff being included as the final climb of Stage 6 into Boulder, Colorado. When I asked Tom if he would consider traveling to France in 20 years with his son to be a fan at the Tour de France, he enthusiastically responded, "oh yeah of course, I mean I am a fan too," (he regularly reads the local news and race results at 303Cycling.com). 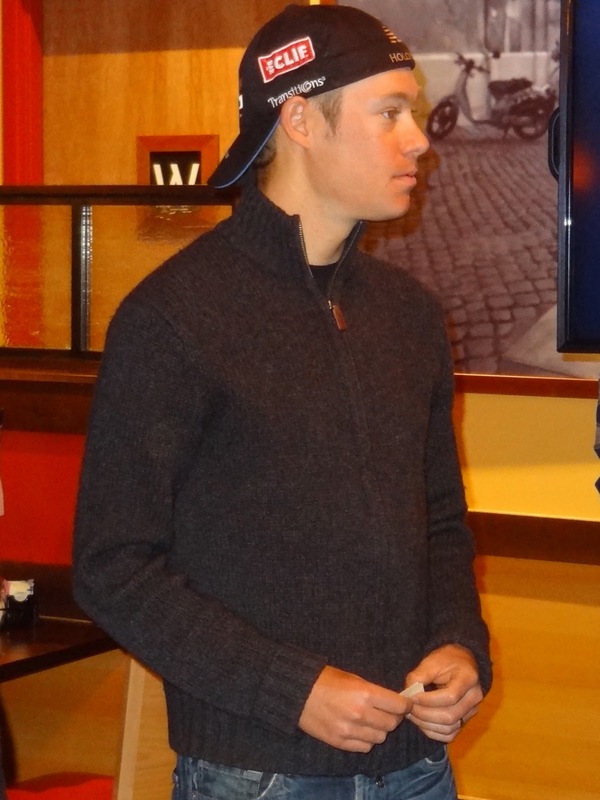 He immediately added that he would go to the USA Pro Challenge and Tour of California as a fan as well. Tom's belief that these races on home soil will survive and prosper, as the Tour de France has, to be there for young riders in this country, was on the front burner of his mind. The USA Pro Cycling Challenge is that important to Tom Danielson. 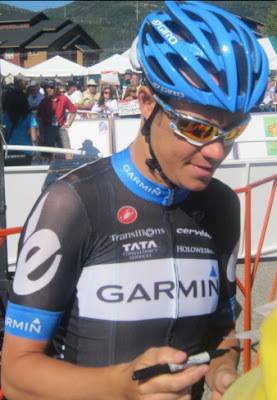 Attending Fort Lewis College in Durango, Colorado, and competing as a collegiate mountain biker before switching disciplines to road cycling, Tom Danielson has ridden all of the roads in the 7 stages of the upcoming 2012 USA Pro Cycling Challenge. Tom knows this state very well. Born in Connecticut, he now lives part time in Boulder, Colorado and Girona, Spain, but admitts he will chase the good weather during training season. He is clearly passionate about three things: youth and cycling, racing very difficult stage races, and his family. Tom Danielson is a fascinating athlete to sit and speak with. He left me thinking, he left me inspired, and we all know that is probably the most we can ask from any good conversation. Tom Danielson has become one of the best cyclists in the world and without a doubt his love, discipline and intensity for this sport shines through. His presence overflows with the self-constrained energy, that seems ready to burst from every cell, that is common among elite athletes. What inspired me most was Tom's response to my question, "When you were a collegiate mountain biker, did you have dreams of racing in the Tour de France?" "It wasn't on my radar." "I've learned to adjust my dreams," he said. "First I wanted pro clothing, then to win a race, then to be on a World Tour team, then to win a World Tour race." His coach at Fort Lewis College in Durango, Rick Crawford, encouraged him to "look bigger." That is the thing with dreams he said, "in your mind you make it out to be huge, but when you are there it is so simple and normal." He said when he was on the podium at the 2011 Tour de France, it felt as close and comfortable as where we were sitting at that moment in the restaurant. If anyone embodies the proof that dreams can come true, it must be Tom Danielson, but he was conveying to me the honest approach of step by step, and the fact that dreams need not be overwhelming. When Tom entered Tossa, a pizzeria in Boulder, last night, a video recap of the 2011 USA Pro Challenge was playing on the big screen, it caught Tom's eye and it was obvious he could have sat down happily watching the film with delight. The images of racing enthralled him, he had to deeply concentrate to take his eyes off the action to begin talking to the fans, sponsors, press, and local city government officials who had come to the event with hopes of meeting him. He is a bike racer who says he responds more to the difficulty then the terrain. I asked how he was on cobbles, "Good, my mountain biking skills help, I am light but, good". I asked if he is aware when fans cheer for him at races, and he said sometimes he is "so in the zone I don't hear the fans, but if the pace is slow, I definitely hear them, in Colorado I could hear the fans calling my name, it was surreal." I asked him if he was more receptive to fan autographs before or after a stage. He said he felt autographs were a responsibility, but "I enjoy it," and is more than happy to sign autographs for fans at a stage start or finish, but preferably not before a time trial. When I asked if he had ever asked for an autograph himself, he responded, "yes, I remember looking up to them ... being on the outside." He remembers those who didn't sign, I clarified, "did not?' yes he said with a twinge of sadness and lesson learned, "didn't." Tom Danielson clearly understands what it means to a young athlete to receive an autograph and encouragement. After the event last night, in speaking with Tom Danielson and CEO of the USA Pro Cycling Challenge Shawn Hunter, the common theme from both men was the importance of fans and encouraging families to come to the race. They are sincere in their interest of encouraging the next generations of cyclists in the United States. I can't wait to see what the USA Pro Cycling Challenge is able to accomplish this year, and who Tom Danielson will inspire every time he goes out for a bike ride. Ten years from now we will hear a new champion say, "I remember seeing Tom Danielson climb Flagstaff, I was so inspired." Words you will never hear Tommy D say, "does this sweater make me look fat"
at 130lbs and 5'10", he was born to climb - fast! Holds the record and bested his Team Manager (and a good climber himself) Jonathan Vaughter's best time up Mt Evans by 8 minutes 8 seconds, as well as holding many other climbing records. Tom Danielson's family comes to support him at his races. His son has been to the Tour de France, Vuelta a España, the Tour of California, and the USA Pro Cycling Challenge. He is only 19 months old. About Mt Washington in White Mountains, New Hampshire - Tom's favorite climb in the USA Avg 11.9%, Max 19%, Length: 12 km (7.45 miles), Height top: 1909 m, Height start: 477 m, Gradient: 1432 m, Difficulty score: 239.57 ! (in comparison the west side of the Col du Tourmalet has a difficulty score of 163.49). Tom Danielson holds the record set in 2002 in 49:24, the only person to make the ascent in under 50 minutes. Iron Horse - 1:58:00 Silverton, Colorado: record 2003 . Avg speed 23.9 mph, elevation gain: 6005 ft for 47 miles. Col de la Madone - 30:24 Menton, France. Elevation gain: 2850 feet. Length: 7.5 miles. Average grade: 7%. Mt Evans - 1:41:20 Evergreen, Colorado: record 2004. Elevation gain: 6500 feet. Length: 28 miles. Average grade: 5.5%. Top Elevation: 14,000 feet and the highest paved road in the United States. Mt Washington - 49:24 White Mountains, New Hampshire: record 2002. Elevation gain: 4727 feet. Length: 7.6 miles. Average grade: 12%; extended portions, 18%, final 50 yards, 22%, 35% of the road is very hard packed gravel and 65% is paved. Brasstown Bald - (?) Georgia: record (?). Elevation gain: 2250 feet. Length: 3.1 miles. Average grade: 14, max 20%. 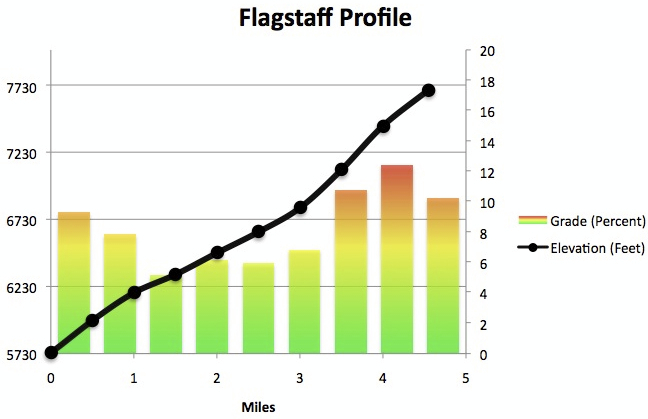 Flagstaff - 20:02 Boulder, Colorado: record 2011. Avg 8.1%, Length: 7.32 km (4.55 miles). Lookout Mountain - 16:02 Golden, Colorado. Starting Elevation: 6084, Total Elevation Gain: 1293, Average Grade: 5.1%.